We visited Bao Sheng Durian Farm and joined the durian fest. I am surprising to see the owner Mr Chang at the Maxis Jom Durian Festival within the same week in Kuala Lumpur, the farm was the supplier to the durian festival. 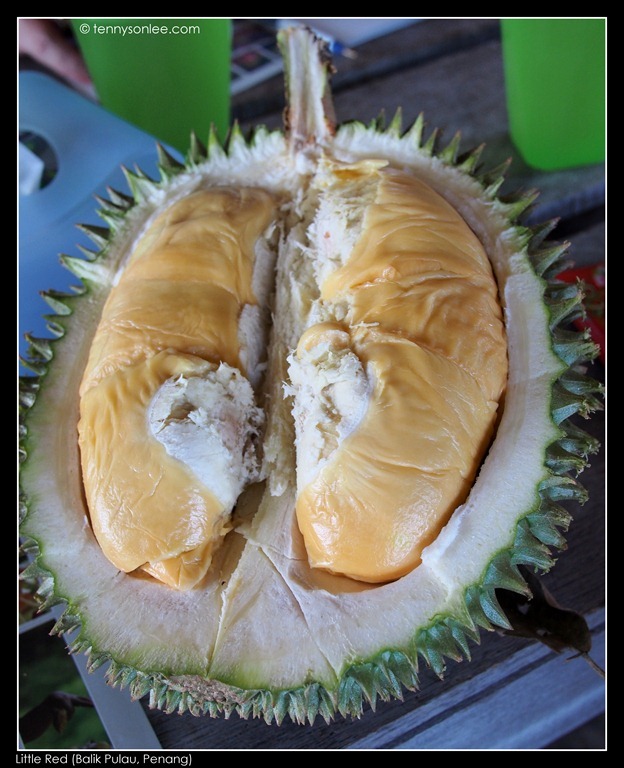 Anyway, there is no ‘best’ durian cultivar but plenty of good durian varieties in South East Asia. 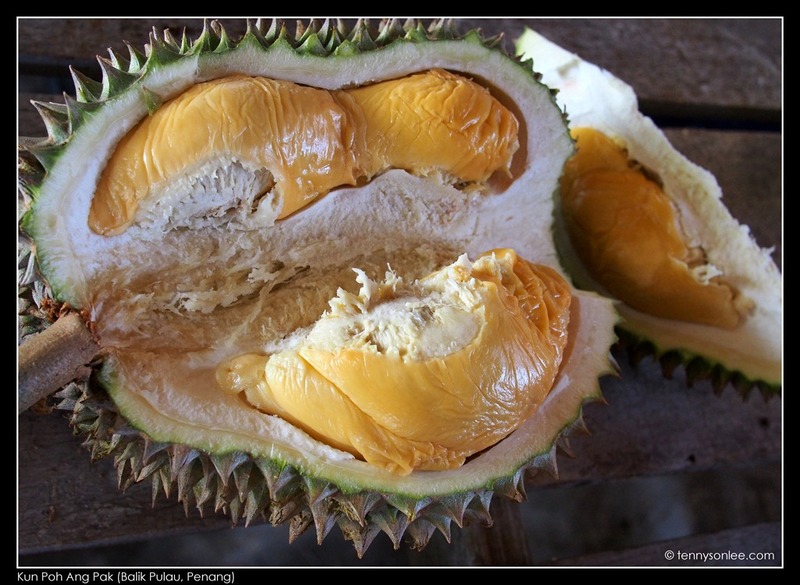 My favourites are Malaysian durian naturally ripe (and drop) from tree. Some rare cultivars are not sold in public because of the limited supply. Here were the 6 cultivars (different varieties) of Penang durians we tried at Balik Pulau. Hor Lor is one of the variety that can be easily recognized by the shape of the shell and the dry (sticky, less moist, creamy) flesh. I personally like softer and bitter flesh, so this variety is not for me. According to the durian catalogue provided by Bao Sheng Durian Farm (see, it was a big biggest, it comes with product catalogue), Kun Poh “was named after the late Lau Khun Poh who first bud-crafted it”. I love the bitter sweet taste and the super thick flesh. 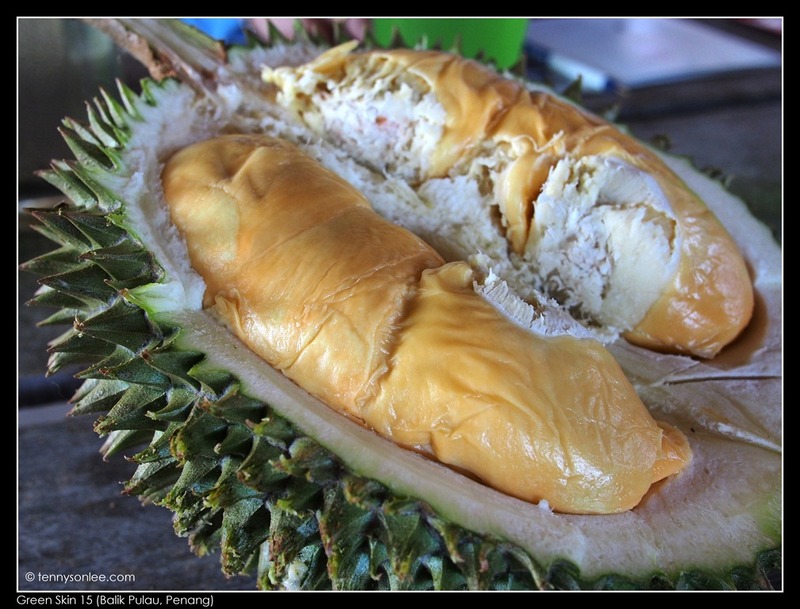 Too bad there is no coffee to go with this durian. ‘Little Red’ has the cutest name in Chinese. It sounds like a young lady’s name. The flesh is sweet and creamy. 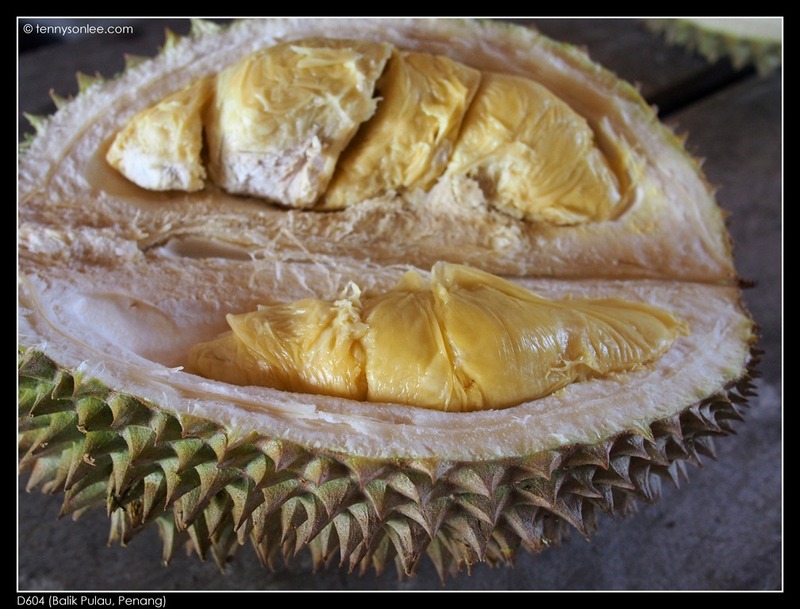 Green Skin got its name from the bright green thorny skins (which durian does not have thorns?). Choose the wrinkled flesh, it tastes better. D604 sounds like name of atomic bomb. The freshly dropped fruit could numb your tongue. Damn it! 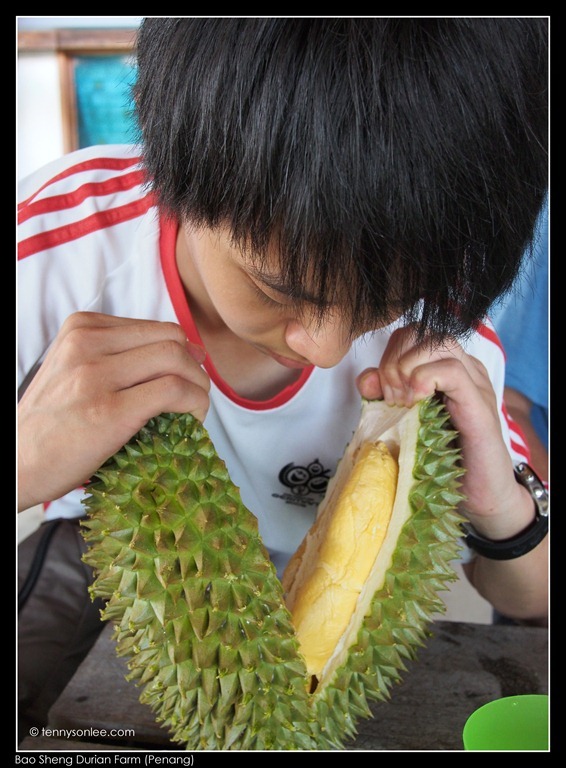 I am hungry for more durians now. 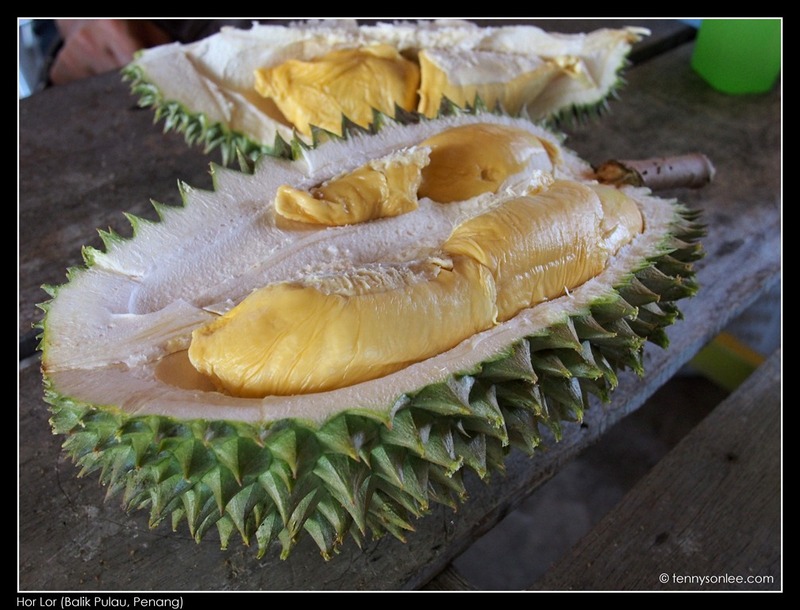 I will post more durian collection from other trips such as Raub (Musang King). This entry was posted on June 16, 2012 by Tennyson. It was filed under Malaysia, Penang, Places and was tagged with Balik Pulau durians, D604, Green Skin, Hor Lor, Kun Poh Ang Pak, Little Red, Red Prawn.